Creating a 3D art deco radioFive local schools will be joining in a colourful procession through Bangor High Street at 1pm on Thursday 20 July as Pontio kicks off its biennial 9 day circus extravaganza. The theme of the circus procession this year is ‘Bangor’s Lost Stories’, and five local schools will be telling these stories through the artworks created especially for the procession. 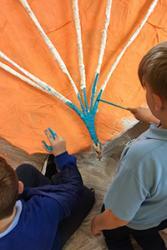 The schools taking part are Ysgol Hirael, Ysgl Glancegin, Ysgol Glanadda, Ysgol Llandygai and Ysgol y Felinheli. Pontio’s Arts Development Coordinator Mared Huws has worked alongside circus company Cimera to coordinate the procession. Also taking part will be Codi’r To and some members of the cast from Circolombia, a circus company all the way from Bogota, Colombia to Bangor, who will be performing their show ‘Acelere’ six times in Theatr Bryn Terfel between 21-23 July. The five ‘lost stories’ which will be told as part of the opening procession include Owain Glyndŵr’s meeting in Bangor with Harry Hotspur and Lord Mortimer before their attempt to seize the crown – a meeting mentioned in Shakespeare’s Henry IV – told by Ysgol Hirael. Ysgol Glancegin and the Codi’r To project will be representing the famous visit by the Beatles to attend a visit by the Maharishi Mahesh Yogi in Bangor in 1967, with a giant 3D Yellow Submarine. Ysgol Glanadda have created a giant elephant, to represent the elephant left in Bangor after it died during a visit by a circus company. Ysgol Llandygai will recall the pineapple garden at Penrhyn Castle, planted to remind the family of their time in the Caribbean, whilst Ysgol Felinheli will carry a 3D art deco radio to recall how the BBC moved to Bangor during the Second World War. 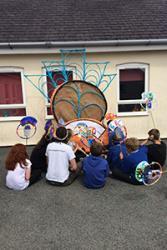 Storiel will also be displaying objects linked to the themes of the procession in their community case as part of the Circus Feast. If you have any more artefacts linked to these Bangor stories, Pontio and Storiel would love to hear from you. The procession, which will include circus skills and music, will begin from Pontio at around 1pm before carrying on past Glanrafon Car Park, across the Cathedral Gardens and up to the clock, down the High Street to the Cathedral and back to Pontio. The artworks will then be put in place at Pontio to be displayed for the rest of the week. Businesses on the High Street are being encouraged to get involved in the Circus Feast by sharing information, displaying posters and a special window ‘tag’ artwork. Pontio’s Circus Feast will run from 18-27 July and includes six performances by headliners Circolombia in Theatr Bryn Terfel, free outdoor and indoor performances, workshops, circus-inspired films, sharing events, music and food and drink. Take a look at the full programme at https://tickets.pontio.co.uk/Online/17Syrcas or pick up a copy of the Circus Feast guide in Pontio. Pontio’s Circus Feast is made possible through the support of the Arts Council of Wales, the National Lottery, Cyngor Gwynedd and Bangor University.